While overseas, I regularly find that people are shocked by my being Australian and not being a pro-surfer. Oddly enough, that I don’t hunt crocodiles, bellow “Crikey!” or ride in a ‘roo’s pouch seems to escape scathing popular opinion. But admitting to not being able to surf? Wow, I almost need boxing kangaroo gloves to defend that one. 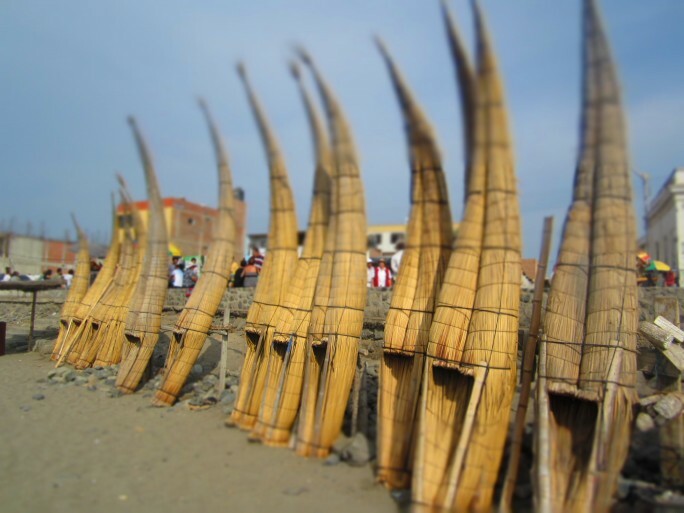 That happy learners’ heaven was Huanchaco, a Peruvian beach town not far from Trujillo and a serious base camp for the country’s surf culture. In fact those northern beaches are thought to have been the birthplace of the sport, occurring in a eureka moment reminiscent of Archimedes in his bathtub when ancient fisherman first thought to stand atop their single-man reed boats and ride the waves back to shore. I signed up for a single class with a school guaranteeing that your class would be free if you didn’t stand by the end. I thought to ask if a class had ever been given for free. “Not for years,” I was assured…and felt immediately embarrassed for being the doofus who would break the school’s winning streak. My very first class was 50/50 classroom theory to practice. At first it sounded like a lot of time away from the beach, but as we began work I realised that learning the basics on the sand, surrounded by curious toddlers, goofy pelicans and flirting teenagers wasn’t at all conducive to learning. Distraction was high and those lessons were often cut short as a result. In our classroom, we were free of pesky irritations and covered the theory without trouble. Soon it was time to see if all that conceptual study could be transferred to the water. Working with two students to one instructor, we practised on baby waves and learned how to stand as directed. A couple of juicy stacks followed before – surprising myself more than anyone – I stood, not once, but several times. There I was atop sweet little waves, feeling the absolute force that even a small amount of water had rushing beneath the board, smiling at how insane it was to be pushed by power of the sea and shocked at how quickly the shore was heading for me…all in the seconds it took for my beginner’s inability to coordinate my movements with those of the board to send me toppling into the water. Of course, one lesson wasn’t enough. Four more followed – in which we touched on paddling, timing your strokes to the waves, sitting, types of waves and selecting which ones to attempt. Everything they say is true: surfing is beautiful, but an intense workout. The constant drift of the waves dragging you further away from your position means a lot of paddling against the current to return. By the end of each day, my back and arms couldn’t fathom trying again – but still I would, drawn in each time by the allure of making this attempt better than the last. I’m not strictly a water person, yet taking surf lessons made me appreciate the beach so much more. The experience comes highly recommended; whether for Australians hoping to become more so, or for anyone who wants to see for themselves why this sport has enchanted people for so long. Hi Erin. Enjoyed your post. 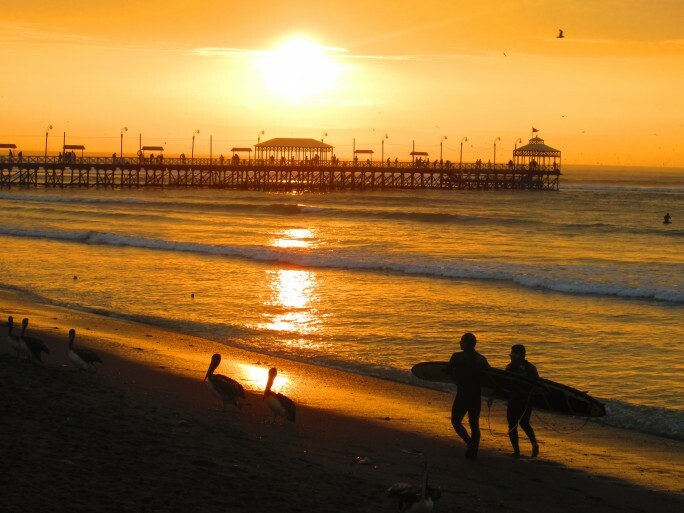 I have always wanted to surf but our sharks (I am also an Aussie) do bother me, so I have put the Peruvian beach mentioned in your post on my To Do list. Happy surfing! I knooooow. While all evidence tells us that you’re more likely to be killed by a packet of Twisties than a shark, they continue to freak me out…Enjoy your surfing adventure! I get the same thing being Canadian: “You snowboard, right?” Well, I do *ski* which kind of redeems me. I think that snowboarding, surfing, and skateboarding (none of which I’ve tried) probably have similar skills. Do you snowboard? If yes, did it help with surfing? Heather, no I’ve never tried snowboarding though I think that it would definitely help as you’d be used to that sliding motion and the feeling of things coming at you quickly!! As I’m famously uncoordinated, skiing, snowboarding, ice-skating and skateboarding would all present challenges! Love Love Love Peru, and loved this post. Thanks Steve! It’s a pretty special country, hey?? Can’t wait to go back!